The sweetest onstage show adapted from the beloved children's book of the same name "We're Going On A Bear Hunt" will tour Australia early 2018 performing at four Melbourne venues in January. This fun-filled theatrical show invites young children and families to enjoy the tale of the intrepid family (and hilarious dog) who venture out through the swishy swashy grass, the splishy splashy river and the squelchy mud, in search of a bear. 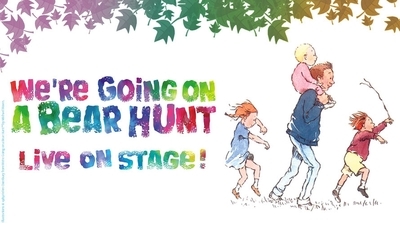 The innovative "We're Going On A Bear Hunt" stage performance is a fun-filled, musical take on the book. The show returns to Australia direct from London's West End after previous sell-out seasons in Melbourne and at the Sydney Opera House. The show features music, laughter, songs, rhythms, rhymes and repetitions; and with puppetry, paints, water and mud, not to mention a bear but - we’re not scared! We're Going On A Bear Hunt: You can't go over it, you can't go under it, but you can watch it!